When I came across this unique little antique chair on a local classified add I knew I had to have it. I was instantly in love with the lines and curves (not to mention the original castors!) 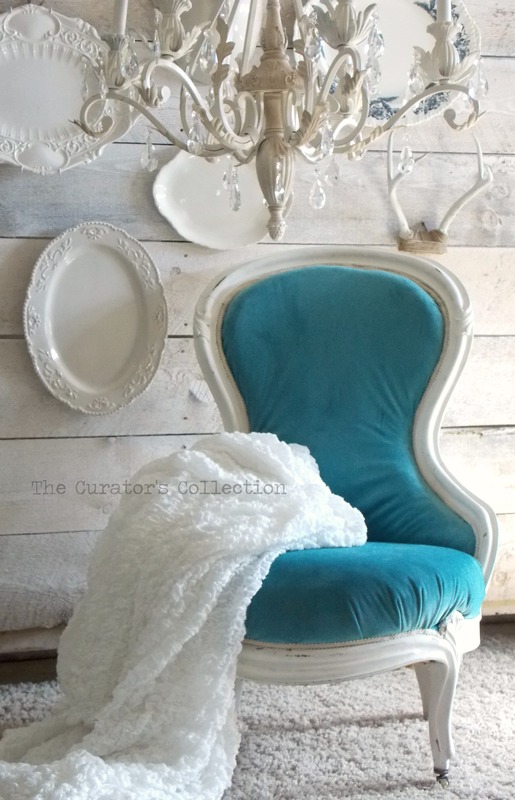 of this sweet chair and knew it had the potential the be pretty once more. I picked it up and drove straight to see my friend Angie so she could help me choose and order some fabric for it. Angie owns the shop where I get my FAT Paint but she also has the most incredible selection of fabrics! 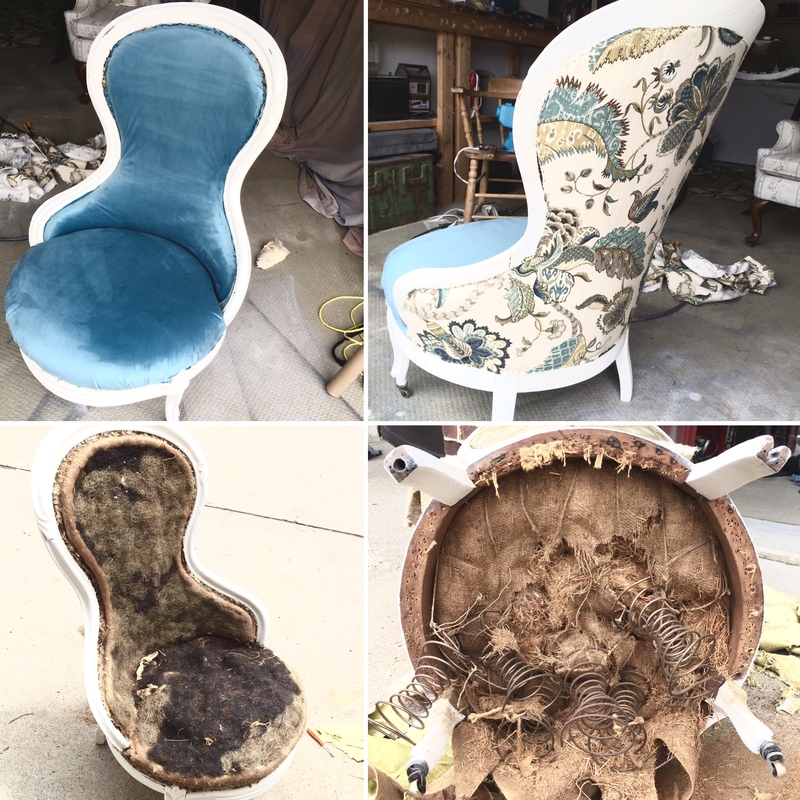 I didn’t want to upholster this sweet chair in just any fabric, I wanted her to be dressed in a higher quality than what I could buy at the big box stores. I wanted her to be dressed as unique as she is and when you are around 100years old, you deserve the best! 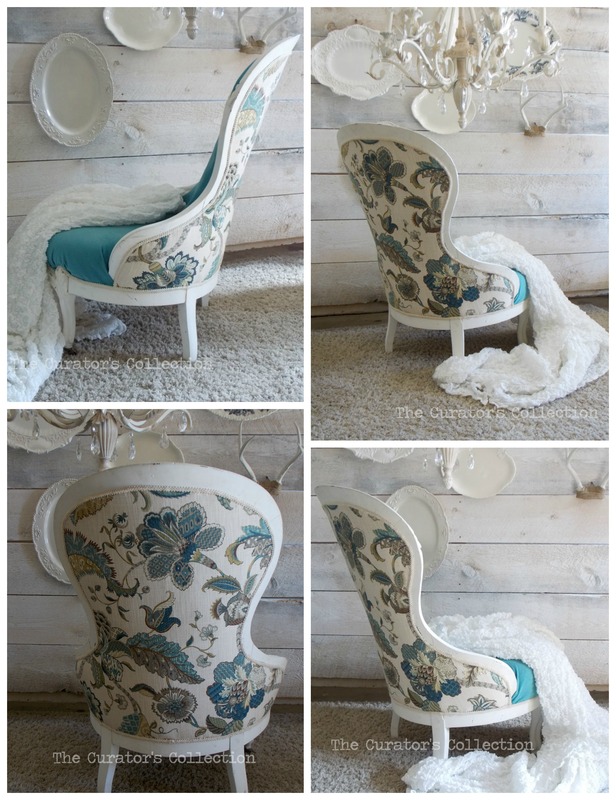 After choosing my fabrics and placing my order I rushed home to deconstruct and paint it. I chose to paint the frame first before removing the original fabric, somehow I knew it would be easier that way and I would then have a guide as to where the new fabric should reach. Filled with horse hair and straw this project was fast turning into something larger than I thought … not to mention a lovely skin rash … ewe! Because the seat was in such poor condition it ALL had to go and I was eventually left with just a skeleton of a chair. Instead of putting the springs back in I decided to cut out some wood to serve as the support for the seat. After fitting it perfectly and attaching it to the frame I began layering it back together with new foam and batting. Then it was finally time for the fun part of redressing her! I chose a fine quality teal velvet for the front and a fun but classy print with teal accents for the back. Oh my she’s so pretty in her new dress! After some trim it’s time for a brief photo shoot! She is currently looking for her Forever home so if she has stolen your heart the way she has stolen mine, please contact me via email! Thank you Catherine! REfreshed indeed! I hope you have a great week! Beautiful, she looks like she is dressed for a wedding. Thank you Cynthia! She really does look royal ;) I hope you have a great week! The chair is gorgeous. It will be hard to part with. 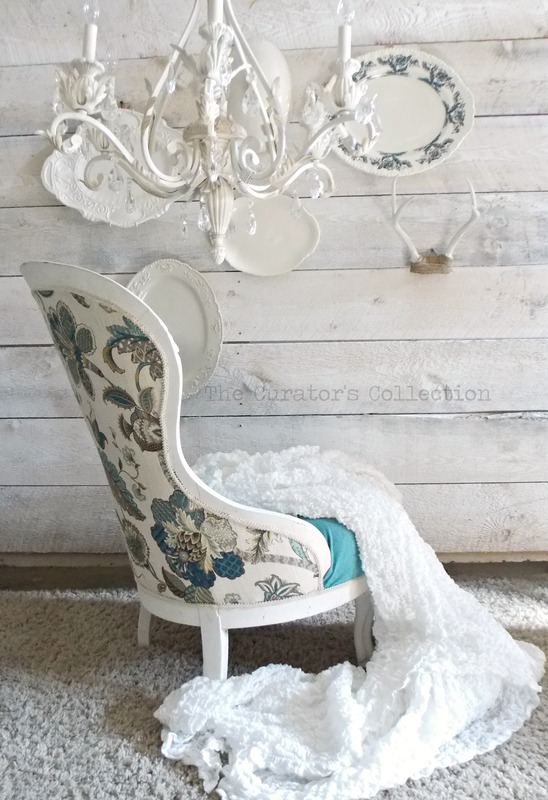 It really is a pretty little chair! As much as I love it I can’t keep it all ;) I hope you have a great week Deb! Geez, I don’t think I could have gotten over the dismantling. Kudos to you for seeing this one through. It’s lovely! Thank you! It was rather disgusting but well worth the hassle in the end! I hope you have a great day! Wow, what a great transformation! I think I would have cried when all the bits, pieces, and springs came leaking out. The contrast fabric on the back – two thumbs up; overall results AweSome! Ha, ha … yah, I think I felt a little sick when that happened! 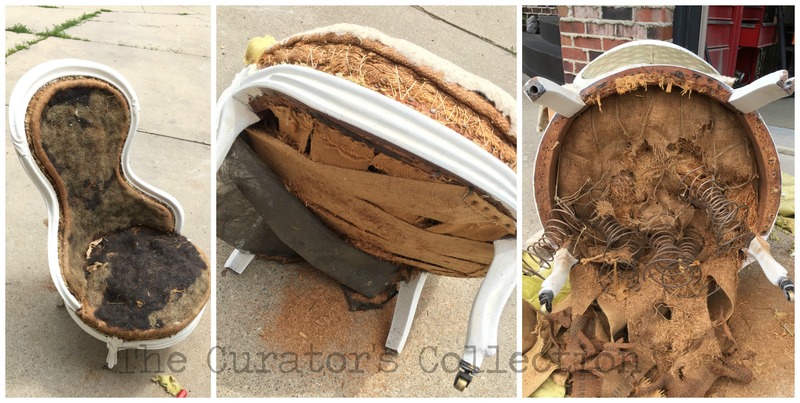 It was supposed to be a simple easy makeover that turned into a hot mess with the removal of a few tacks! I’m so happy she turned out so well! I hope you have a great week! Awe Thank you Marie! That velvet is incredibly soft and luxurious! I hope she finds a good home soon! Thank you for the pin and the share! You are sweet! This is stunning! 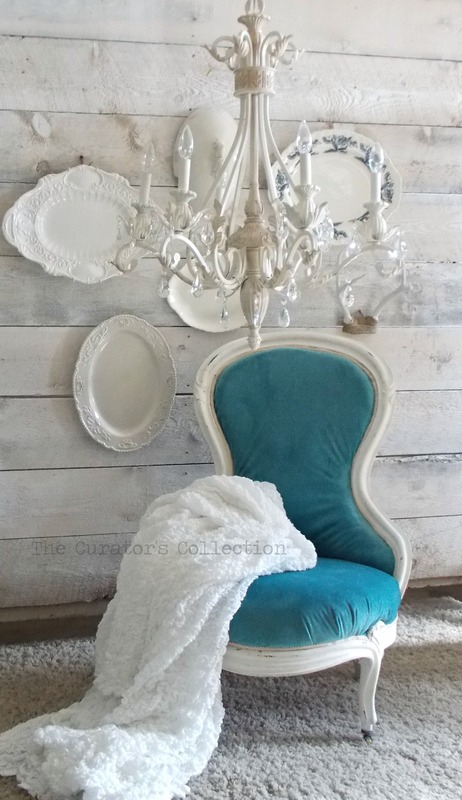 I love seeing beautiful items given new life! Thank you! I love how she turned out! I hope you have a great day! Thank you Judy! Your sweet comment is appreciated and thank you for taking the time to comment!